I have always used a normal manual toothbrush, I never realised how inadequate they were until I tried the Philips Sonicare DiamondClean Electric toothbrush, I was blown away by how clean and sparkly my teeth were - even after the first use my teeth were noticeably cleaner and whiter. I normally go to a hygienist dentist every few months to get my teeth professionally cleaned, to remove plaque that a normal toothbrush cannot get to. After the first few uses of my DiamondClean toothbrush it had removed all noticeable plaque build up! I was honestly shocked, it's like a mini hygienist! I now don't need to go to my dentist as much because my teeth are so clean and white. Using this brush twice a day will give you amazing results! It also plugs into your computer! 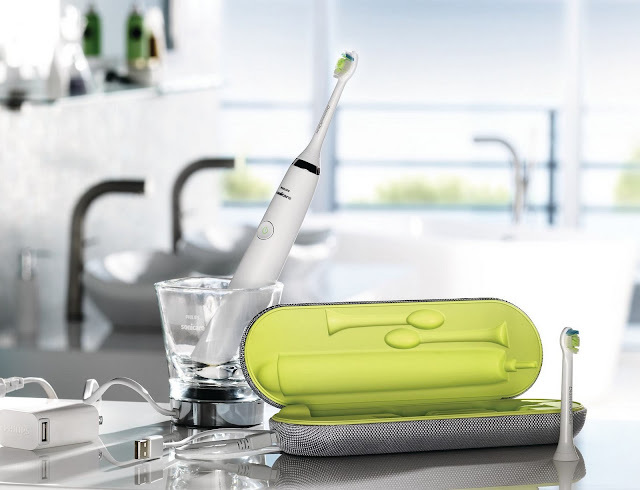 It comes with a nifty chargeable glass which will conveniently charge your toothbrush after every use. Two 'snap on' brush heads are included, one larger for all-round cleaning and one small to get right into each tooth gap. Diamond-Shaped bristles create more scraping surfaces to sweep away plaque. The kit includes a charging travel case which has a USB connector, which is perfect when on the move. Plug it into your PC and it charges in no time. The toothbrush has 5 cleaning modes: Clean, White, Polish, Gum Care and Sensitive. I would never go back to a manual toothbrush! My teeth will thank me for it. You can pick up one of these for £250, which is pricey but honestly worth it. The clean you get is like a dentist clean and you will have it for years as the heads are replaceable. This review contains a sample product sent for consideration by PR. This is my 100% honest opinion. Thansk for sharing this! This kit looks very stylish! I used to use an electric toothbrush, but it stopped working and I still haven´t bought a new one even though I know electric toothbrush is much better for cleaning my teeth. Ohhhh looks so damn fancy! My dentist basically yelled at me the other day to upgrade to an electric toothbrush! :p call me old school but I really have no desire to spend 20 bucks on a toothbrush, but hey I guess dental hygiene is worth it. It is scientifically proven that rotating oscillating toothbrush and sonic toothbrushes remove significantly more plaque compared to other (electric) toothbrushes. I've been using the new 'Oral B triumph' and I totally agree. I have wanted to try an electric tooth brush for so long but have been hesitant due to the price tag. When I do finally buy one, this one just might be it. Thanks for the review!